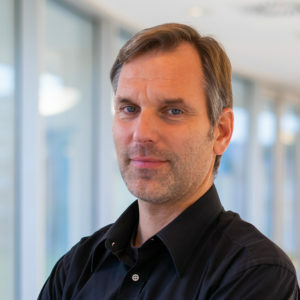 Sascha Sadewasser is currently the Head of the Department of Quantum Materials, Science and Technology and is the Head of the Laboratory for Nanostructured Solar Cells. Sascha focuses his research in the areas of advanced concepts for chalcopyrite thin film solar cells and two-dimensional chalcogenide materials. He is an expert on Kelvin probe force microscopy, which he applies to the characterization of semiconductors and thin film solar cell materials. His group develops advanced solar cell concepts, ranging from passivation layers and micro-concentrator solar cells to quantum dot concepts and 2D chalcogenide materials for optoelectronic applications. Sascha Sadewasser holds a Dipoma (1995) in Physics from the RWTH Aachen, Germany and a PhD (1999) from the Washington University St. Louis, MO, USA. He did a post-doc (1999-2003) at Hahn-Meitner Institute Berlin (Germany), and was a Ramón y Cajal scientist at the Centro Nacional de Microelectonica in Barcelona (Spain) Spain from 2003 to 2004. From 2005 until 2011 he was the group leader of the Nanoanalytics and Nanofabrication group at the Helmholtz-Zentrum Berlin (Germany) and the deputy head (2008-2011) of the Department for Heterogeneous Materialsystems. In 2011 he obtained his Habilitation in Experimental Physics from the Free University of Berlin, Germany. Since July 2011 he is the Principal Investigator of the Laboratory for Nanostructured Solar Cells (LaNaSc) at INL. Scientific Reports 7, 41361 (2017). Sol. Energy Mat. Sol. Cells 159, 496 (2017). Sol. Energy Mat. Sol. Cells 143, 9 (2015). IEEE J. Photovoltaics 4, 1644 (2014).